Earlier this month I attended a one-day Agile software development class at The Forge by Pillar in Ann Arbor. A few of my teammates from work attended the class with me; the class ended up having around 25 attendees total, with maybe a third of those being developers. On the morning of the class, we learned that as part of the activities of the day, we would be implementing a functional clone of a classic arcade game of our choice (Pac-Man, Space Invaders, Centipede, etc. ), using a tool called Scratch, in 3 20-minute development sprints. This initially struck me as aggressive -- a new game, complete with graphics, written starting from scratch, done in not a day, but in 60 minutes? I suggested to my team that we do an implementation of Frogger, as that struck me as being relatively straightforward to implement. After writing up user stories (requirements) with my team, the class instructor did a quick demo of the Scratch tool; then, the first development sprint started, and I was able to get hands-on with the Scratch tool for the first time. Within just the first couple of minutes of that first development sprint, I had a far better idea of what Scratch was, what it could do, and how long it would take to do things with it. In short, Scratch allows you to set up sprites (characters, objects) on a playing field, and then manipulate them via a simple "drag-and-drop" event-driven programing framework. This experience was striking as an illustration of the additional accuracy with which a project can be estimated, and how much better specific "unknowns" about an implementation can be identified, after there has been an opportunity for the development team to get some hands-on engagement on the project – particularly in projects involving a language or framework that is new to the development team prior to the project. What’s my favorite technology purchase that I’ve made in the past 2 years? It’s my iPad Pocket Edition; I also like to call it my $0-monthly-fee iPhone. That is, my iPod Touch. My iPod Touch (or “iTouch” for 33% less syllables) has become one of the items that are always in my pants pockets when I leave the house in the morning, along with my keys, wallet, and phone. Can’t make or receive phone calls. I work around this by carrying, in addition to the iTouch, a nice compact “dumbphone,” the Samsung Hue, for which I have a prepaid plan with Verizon that gets me phone service for a grand total of $7.50/month. I get very few minutes for that price, but since I only use this phone for quick calls to home and for emergency purposes, I’ve never come close to running out of minutes. No Internet access outside of wi-fi zones. This is occasionally bothersome, but only very occasionally; typically a couple of times per month when waiting to pick up a pizza or to get a haircut. For the significant cost savings vs. a full phone and data plan – more on that below – it’s certainly something that I can live with. And many apps have good “offline mode” support – implemented mostly to cater to iPhone users on airplanes, but working just fine for iPod Touch owners too. No GPS. When I take an occasional long trip alone to an unfamiliar place, I do notice the lack of GPS capability, but it’s nothing that can’t be worked around “the old fashioned way” by just printing directions off the Internet before leaving. (How did people find their way around before the Internet?) On vacations, I’m pretty much always travelling with my wife, and we do spring for a smartphone for her – as a so-called “stay at home mom” she’s actually out and about on a daily basis far more than I am – so we just use her phone’s GPS. If I travelled alone more often, I’d make a one-time purchase of a standalone GPS device for the car. About $1500 to spend however I like, in return for a couple of (for me) minor drawbacks? Yep. I’m in. I like the iPod Touch enough that even though I’ve had my current 4th Gen iTouch for only about a year and a half, I’m also in for another $300 on the new iPod Touch 5th Gen that was announced earlier today. 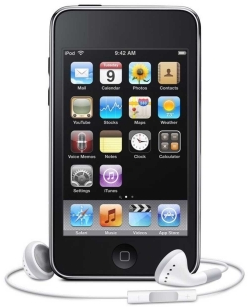 To paraphrase a tip from @shanselman, it’s worth spending money on something that you’re going to get heavy use out of every day – and for me, the iPod Touch is that. And at an amortized cost of under $13/month over the next two years, I consider it a bargain.